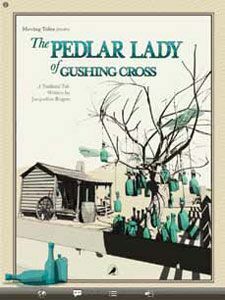 The Pedlar Lady of Gushing Cross tells the story of a poor old peddler woman who discovers good fortune by following her dreams. Written by Jacqueline Roger and inspired by a 13th-century Persian folktale, it has timeless themes found in many cultures around the world. Imaginatively adapted for the iPad by Moving Tales, this multimedia-rich version presents as an interactive storybook complete with voice-over narration (in Spanish, French or English), music, animation, and lush sound effects. Quality and Effectiveness: After children select a language, there are several ways to experience the story. They can listen to each page read aloud and enhanced with music and sound effects. They can also record their version of a particular page and hear their voice narrate the text. A fourth option invites youngsters to read the story on their own while hearing music and ambient sound effects but no narration, choosing the page they wish to read by selecting it with the Navigation button on the book’s toolbar. Ease of Use: The storybook is available through the iTunes store. Once downloaded to the computer, it installs on the iPad much like other apps when you next connect your iPad to sync. It displays only in Portrait mode, and navigation is intuitive. Creative Use of Technology: The storybook takes advantage of iPad features such as tap, swipe and record. While pages present only in Portrait mode, youngsters can animate the text by using the iPad’s accelerometer: They can shake the screen while listening to the narration to cause words and letters to drop from the top of the page. Suitability for Use in a School Environment: This interactive storybook replicates the read-aloud experience, encouraging independent reading in a personalized way. Children can revisit the story or any one of its pages at any time and listen to it being read aloud as often as they like. Additionally, they can take charge of their own reading by recording their interpretation of the text. Studentrecorded text can serve as a tool for formative assessment, helping teachers pinpoint reading strengths and weaknesses. That said, to be truly successful in a classroom, future versions of the story (and other Moving Tales) should perhaps include a readaloud dictionary, into which students can key a difficult word or phrase and listen to a definition. There are several difficult words in this text. Teachers must be prepared to review these words with listeners to ensure understanding. It would also be helpful if narrated words were highlighted on the iPad screen as the narrator read them aloud, as in the Living Books interactive storybooks that Random House/Broderbund brought to the computer screen in the 1990s. When children see words as they are read aloud, they can begin to associate the sound of a word with its written form. Recommended, with the caveat that teachers will have to review vocabulary with students to make sure they understand the story. ¦ It can be used for independent reading, group instruction and formative assessment. ¦ It’s a beautifully rendered text that can be read again and again in English, French or Spanish.